Not much exciting happens in the land of DRAM I know – usually the most exciting things occur when we get a standards change, or when capacities increase. 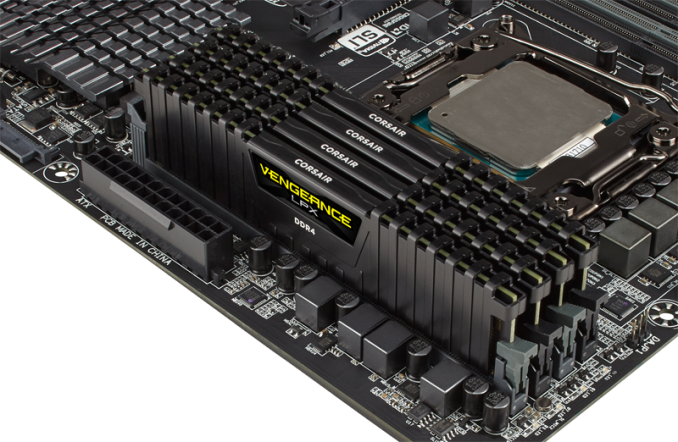 Luckily for DRAM manufacturers we got the first taste of consumer grade DDR4 back in 2014, and almost a year later in 2015 we are now seeing capacities double per module from 8GB to 16GB. We reported on one company promoting their 16GB modules, specifically an 8x16GB kit for 128GB, and now it is the turn of Corsair who is guaranteeing US availability as this press release went live direct from the Corsair website. Aside from the price, the timings are naturally quite interesting. JEDEC specifications for DDR4 come in at DDR4-2133 15-15-15, and most of the modules we saw at the release of DDR4 were on those lines, moving up to DDR4-3200 with a slow rise in subtimings. 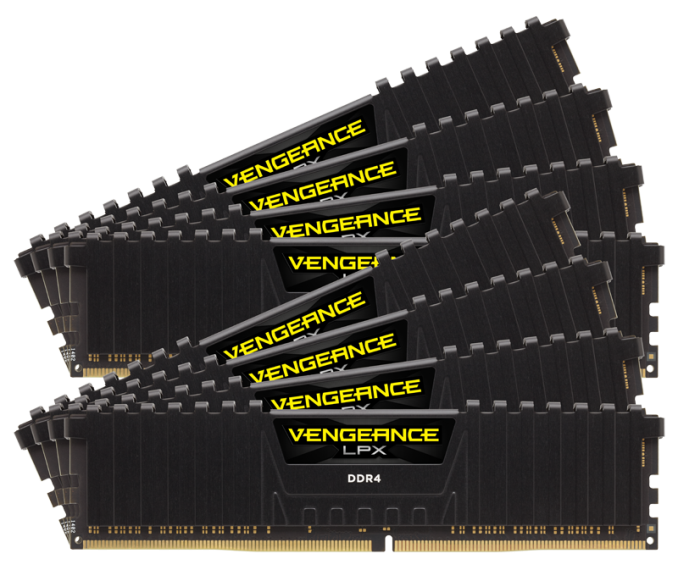 The first two kits from Corsair, the Vengeance LPX and Dominator Platinum, arrive at DDR4-2400 14-16-16, indicating a rise in frequency and a decrease in CAS latency, all while retaining the nominal 1.2 volt specification from JEDEC rather than jumping up to 1.35 volts. Nice. This is around the Performance Index of the midrange kits for both DDR4 and DDR3, indicating a level of performance in that area. 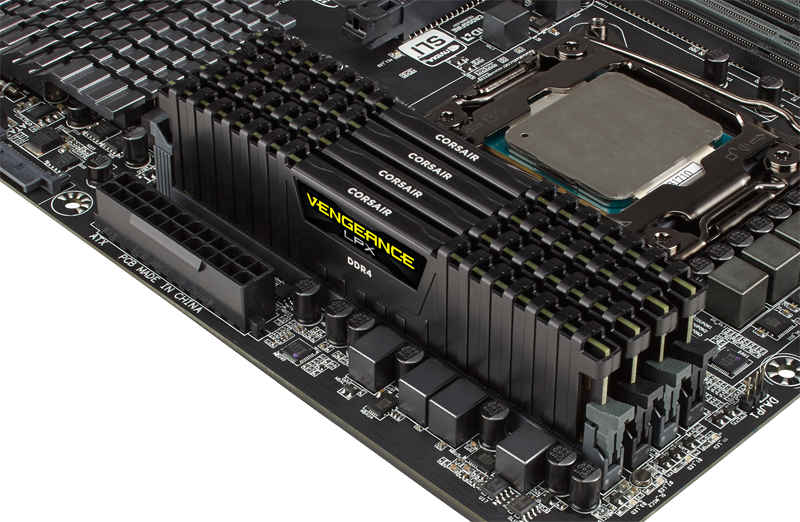 Compare that to a standard DDR4-2400 8x8GB kit on Newegg retailing at $720, which comes out at $11.25 per GB, or a DDR4-2400 4x8GB kit retailing at $330, giving $10.31, then you are commanding a 30%+ premium in order to get the best unbuffered DRAM density available on X99. Of course, whether you need all that is dependent on your workload. All kits are available on the Corsair website now, and come with a lifetime warranty. We have about a dozen DDR4 memory kits in-house that have been sat on my desk for far too long. Keep an eye out for some quick reviews of those in due course. That's not totally true. The PCBs are bigger and beefier too. How much that translates into actual performance/stability however is debatable. For the typical high-end user it is most likely not worth the premium, but if you are one to overclock everything to the max the extra engineering that goes into Dominator might be worth the premium.